Here’s a simple way to bring out great flavor in roasted potatoes. 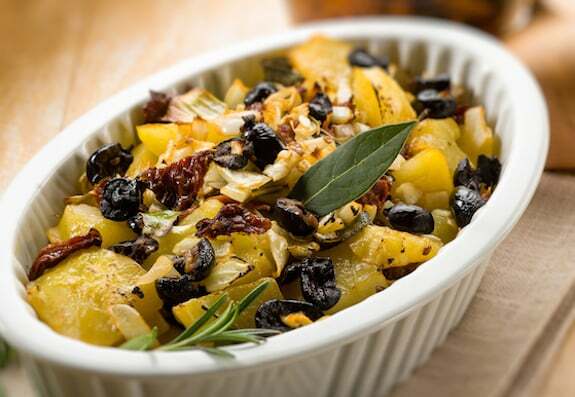 Roasted potatoes are always a treat no matter what; the olives add little bursts of flavor in every bite, and rosemary adds a distinctive flavor. Preheat the oven to 425º F. Line a roasting pan with baking parchment for easy cleanup. Scrub the potatoes well, then cut into quarters. In a large mixing bowl, toss the potatoes with the onion and olive oil. Arrange in a single layer on the roasting pan. Bake for 15 minutes, then add the rosemary, olives, and optional dried tomatoes. Sprinkle in the thyme and paprika, and stir. Bake for 10 to 15 minutes longer, or until the outsides of the potatoes are golden and the insides tender. Transfer the mixture to a serving container, season with salt and pepper, and serve. Here are more easy, tasty potato recipes.